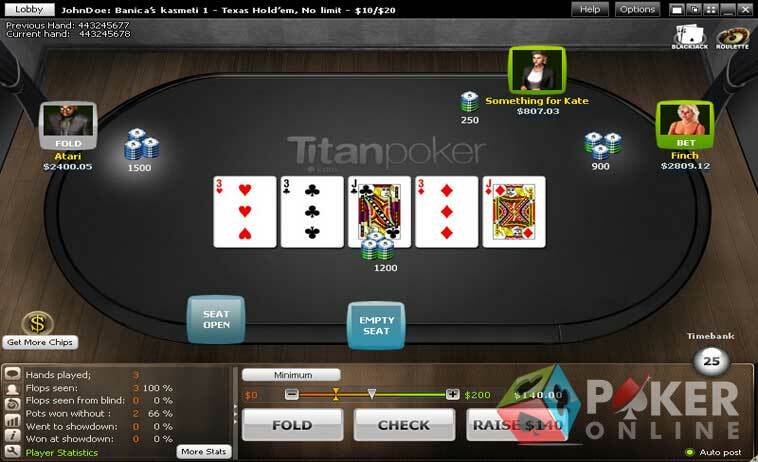 Titan Poker is one of the big names in the industry and is known for its great selection of online poker games and poker tournaments. As a result, it enjoys a lot of player traffic. Remember to use your Titan Poker Bonus Code for great rewardsTitan Poker is a site dedicated to poker players of different skill levels and bankrolls amounts. It provides a wide range of games from low limit poker games to under a dollar to games as high as $50/$100 limit games. Aside from its multi table games and poker tournaments, the site is ideal for players who opt to play for short-handed games. Titan Poker is fast becoming one of the most popular sites in the market and has great customer support and makes timely payouts. There are a variety of special tournaments being held on the site. 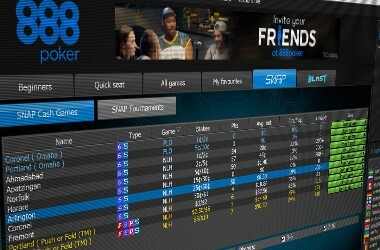 Titan Poker runs on Playtech software, a company that has been in the industry for a long time and has extended its experience to developing a superior software program for Titan Poker. It offers superior graphics and a user-friendly interface. The menu tabs provides easy navigation to your preferred poker game. It offers easy accessibility to the casino where you can have an opportunity to play several poker games at a time. What’s more, you will not experience any glitches or hitches so you can experience a great poker gaming experience. Titan /poker offers /Texas Hold’em, Omaha, Seven Card Stud and other types of poker games. Players will also enjoy the variety of poker tournaments on offer here. 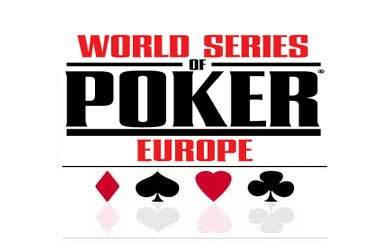 Satellite tournaments to the main draw of the World Poker Tour and are held on a daily basis. There are also tons of bonuses that poker players can avail of at Titan Poker. When making a deposit, you will be entitled to a bonus 200% up to $2000 bonus. Simply use the bonus code TPF625. By playing ring or cash games, you will receive stars and a bonus in $10 increments. Titan Poker also offers bonuses whenever you reload your account. This is determined by the number of points you earned on a monthly basis. Players can avail of a 25% reload bonus up to a maximum of $100. There is also a Refer a friend bonus, where players who refer a friend to Titan Poker will receive $75. In turn, your friend will get $25. Both players will receive GameCalc software free. The tournaments played at Titan Poker attract a lot of player traffic and are one of the main reasons why Titan Poker is so popular. 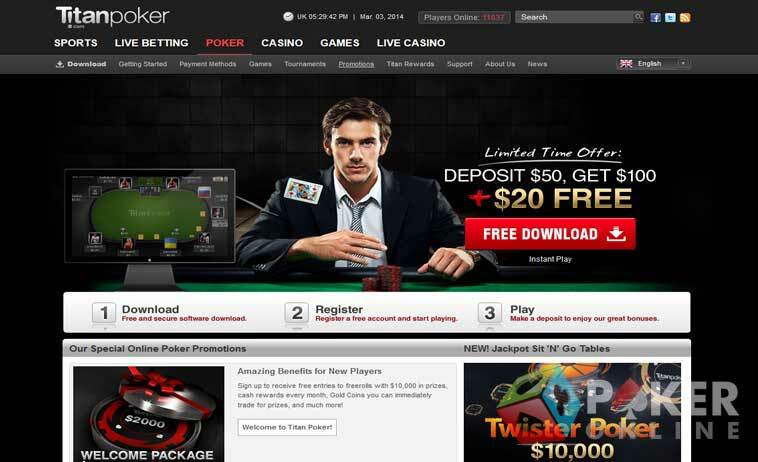 These include the likes of the poker freerolls, points tournaments, VIP Tournaments and more. Players will find that a total of 5 freerolls are being played on Titan Poker on a daily basis. Likewise, there are $50 beginner’s freerolls played at 12:00 and 23:20 daily as well as a $100 freeroll at 17.50. Registration starts one hour prior to the tournament. Point tournaments are held on a daily basis such as the $3,000 buy-in tournament, and $50 points buy-in tournament. Also worth mentioning are the 300, 2000, and 3000 Sit N’ Go tournaments. There is a $500 points buy-in tournaments held every Saturday. Aside from points tournaments, there are $35,000 GP tournaments with rebuys being held. 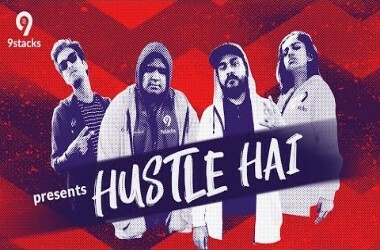 Also, there are $3,000 Freeze-out tournaments and a huge $30,000 Guaranteed tournaments and buy-in tournaments as low as $10 + $1 on a daily basis. Titan Poker also has a great VIP loyalty program, where players become Silver level members on sign up, play and earn points and progress to the next level. The different levels are Iron, Nickel, Bronze, Copper, Silver, Gold, Platinum, Titanium and Diamond. Players will also find that there are VIP tournaments held on a daily basis. 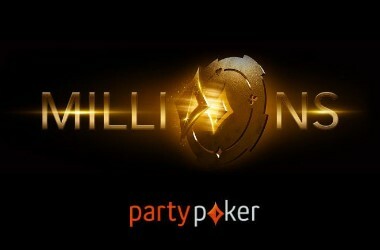 Once you reach VIP Level 2 to 6 will be invited to a $1,000 VIP freeroll tournament held on a weekly basis. Every month, VIP levels 3 to 6 get invites to $2,500 tournaments while VIP Levels 4 and 6 will be invited to $5,000 and $10,000 monthly tournaments, respectively. 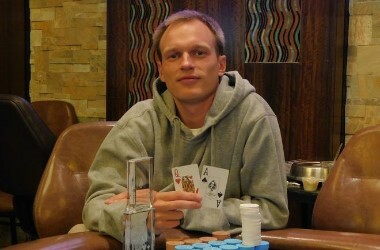 Titan Poker is one of the few sites that allow you to engage in live chat with other poker players. You can also send in any inquiries using e-mail, which are answered promptly. Titan Poker has won an award – the “Best Poker Customer Service” – for its customer services and offers support via email, chat, telephone, fax and postal services. Players will find that the site has toll free telephone services and several email addresses to handle specific query sectors.